Curt Randy Grossman (b. 1952) was born in Philadelphia to a traditional Jewish family. He dreamed of becoming a professional football player from childhood. He started playing in fourth grade. When a high school guidance counselor gave him a questionnaire with three blanks to fill in which careers he would be interested in, he wrote “professional football player” for all three. Grossman was the star of his school’s football and wrestling teams. He continued to impress in college, leading the Temple University Owls to a 9-1-0 record one year. 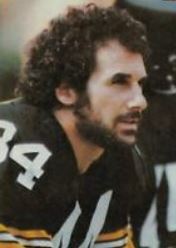 In 1974, Grossman joined the Pittsburgh Steelers of the NFL. That same year, the Steelers won the Superbowl. The following year, the team was back in the Superbowl, and Grossman caught the crucial touchdown pass which led the Steelers to another championship. By this point, Grossman’s nickname was “the Rabbi”. Three years later, he had a career-high 37 receptions in 10 games, and helped the team win another Superbowl. Grossman played for the Steelers for several more years before retiring. All in all, he has 4 Superbowl rings. A Steelers Director of Personnel once said that Grossman had “the best” hands and could catch “whatever was near him”. Today, Grossman runs his financial firm, Wealth Management Strategies, and likes to shoot clay targets with his local Jewish “Clays and Knishes Club”. …the Qur’an specifies that the Land of Israel is the homeland of the Jewish people, that God Himself gave that Land to them as heritage and ordered them to live therein. It also announces that – before the end of the time – the Jewish people will come from many different countries to retake possession of that heritage of theirs. Whoever denies this actually denies the Qur’an itself. If he is not a scholar, and in good faith believes what other people say about this issue, he is an ignorant Muslim. If, on the contrary, he is informed about what the Qur’an and openly opposes it, he ceases to be a Muslim. This entry was posted in World of Sport and tagged American Jews, Football, Jewish Athletes, NFL, Philadelphia, Pittsburgh Steelers, Super Bowl, Temple University on January 30, 2019 by Jew of the Week.